My first meeting with Julia & Matt took place over a beer at one my favourite pubs, The Local in St Kilda East! It was the perfect way to get to know more about Matt & Julia and hear about their plans for a relaxed wedding day in the Yarra Valley. It was delight to work with both of them to design a ceremony that captured their love for each other in a heartfelt yet fun and relaxed style. I loved that they wanted to honour the joining of their two families by incorporating a rose exchange between their grandparents at the start of the ceremony. 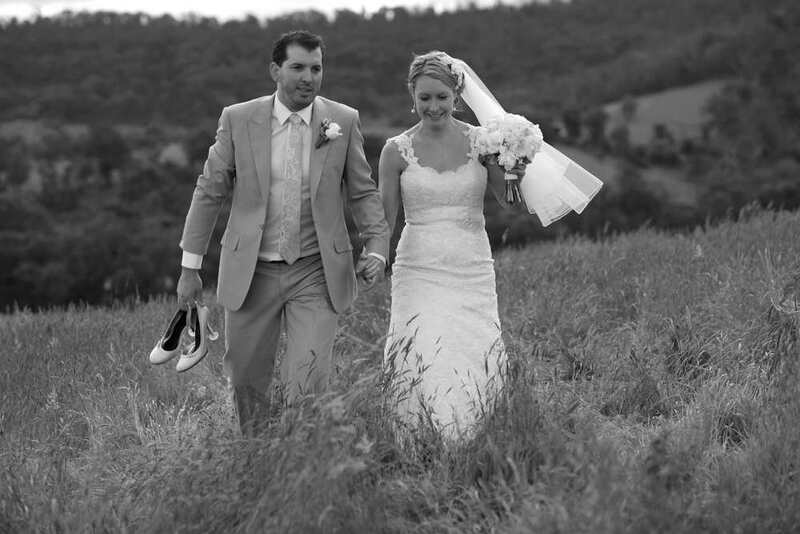 On the 16th November 2013 Matt & Julia were married at magnificent Sutherland Estate in the Yarra Valley, the sweeping views were the perfect setting for this gorgeous couple’s special day. Their lovely nieces and nephews walked down the aisle first, followed by Julia’s bridesmaids, her twin sister and good friends. 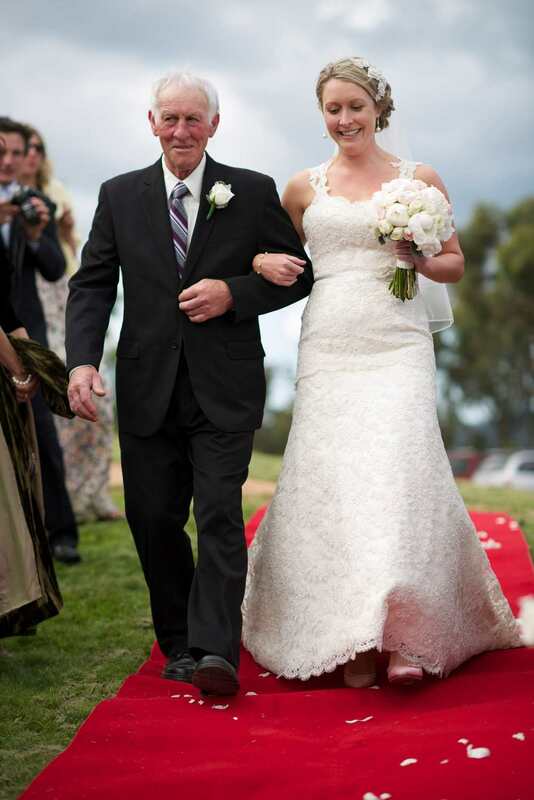 Julia’s very proud Father then accompanied her down the aisle. We recounted the quirky story of how they met, Julia was looking for place to live on her return to Australia after living in the UK and came across Matt’s advertisement for a flat mate for his share house, as their friendship and love developed they also knew they could live together! The story of Julia & Matt’s proposal also delighted their guests, it involved a weekend away, lots of bad weather and a variety of false starts but eventually Matt was able to catch a break in the weather and completely take Julia by surprise at the beautiful Loch Ard Gorge on the Great Ocean Road. One of the sweetest and also funniest moments of the ceremony came when Julia’s Mum presented her surprise reading based on the work of Johann Wolfgang von Goethe’s nine requisites for contented living. Jan added her own spin on each requisite and had props (AFL football scarves) ready to illustrate her point! Whilst the crowed roared with laughter they were also touched by Jan’s heartfelt advice. 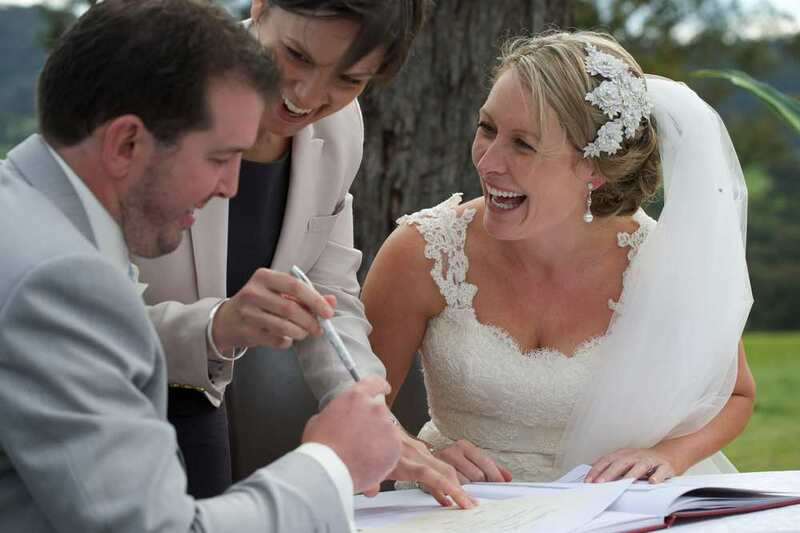 Julia & Matt’s wedding ceremony was filled with so much love and joy, their photos capture just how much fun everyone was having. Thank you so much guys, it was an absolute pleasure to part of your wedding day, let’s catch up one day soon over a beer or two at The Local!